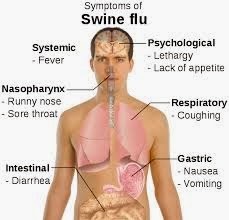 Swine flu or Swine influenza is respiratory disease caused by viruse. H1N1 stands for H1 = Hemagglutinin type 1 and N1 = Neuraminidase type 1. It is transmitted from one person to other person by inhalation or ingestion of droplets containing virus from people coughing and sneezing. Prevention is always better than cure. So protect your family from swine flu. Swine flu medicines are available at various hospitals and chemists. At the time of coughing or sneeze cover your mouth or nose with tissue paper or handkerchief. Do Eat nutritious food, drink plenty of water and sleep well.